This page will provide you with information about having surgery for De Quervain’s disease. For further details, please speak to your consultant. De Quervain’s disease usually results in swelling at the base of the thumb causing tenderness, as well as pain when the thumb and wrist are moved. It is often referred to as ‘washerwoman’ strain or blackberry/gamer thumb. The thumb is moved by two tendons which run through a narrow tunnel (sheath) at the base of the thumb. De Quervain’s disease causes the roof of the tunnel to thicken and narrow, which results in pain when the thumb and wrist are moved. This can also cause the thumb to lock when moved and general stiffness in the wrist and thumb. The main benefit of surgery is to alleviate the pain at the base of the thumb. Pain caused by mild symptoms can usually be reduced with anti-inflammatory painkillers, a splint worn at night, physiotherapy and resting both the thumb and wrist. The problem can also be treated with a steroid injection at the base of the thumb and is successful for 8 out of 10 patients. The operation to release the problematic thumb tendons usually takes approximately half an hour. It can be performed under local anaesthetic. During the operation a small incision is made at the base of the thumb. This allows the surgeon to access and make an incision in the roof of the tunnel causing the pain. Following surgery the tendons should be able to glide freely through the tunnel. Most people are able to go home the same day. It is advisable to keep your hand raised and bandaged for the first two days. 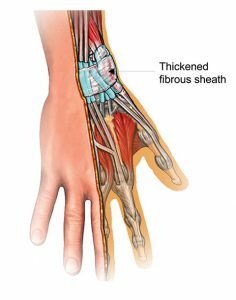 Stiffness can be prevented by gently exercising your fingers, elbow and shoulders. Exercising regularly should help you resume normal activities as quickly as possible, however always consult your healthcare professional or GP for advice before you start exercising. Symptoms generally improve quickly after the operation. If steroid injections have failed to relieve the symptoms of De Quervain’s disease, surgery should alleviate the pain and tenderness experienced when the thumb and wrist are moved.